Figure 1: An example of Spectrum Lab tuned 1 kHz below a local AM radio broadcast station. The “vfo” option is set to -1000 Hz to center the graph at zero. 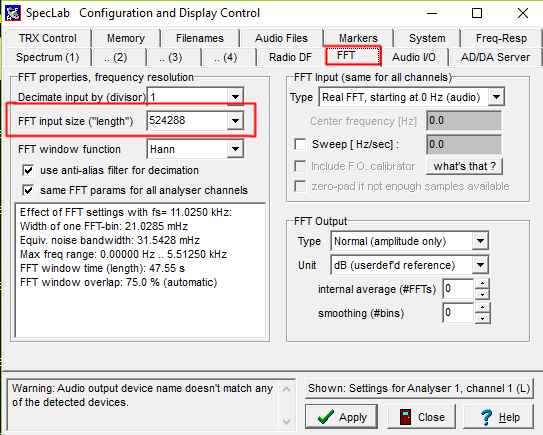 Note this setting does not affect logged data, which will show up near 1000 Hz. The station is about 2 Hz low and varying. Monaural audio is saved to a WAV file and spectrum calculations to a text file. 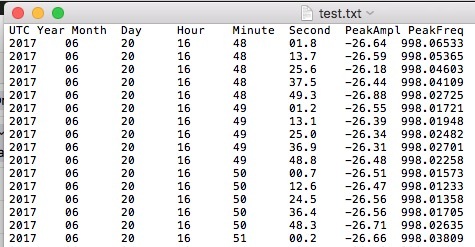 The time on the graph is CDT hours, but the time in the file is UTC. Please note that we understand that there are multiple ways of making accurate Doppler shift measurements. Please feel free to use an alternative procedure as long as it is technically sound and can adequately describe the procedure you used in your final data submission so that others will be able to properly interpret your measurements. 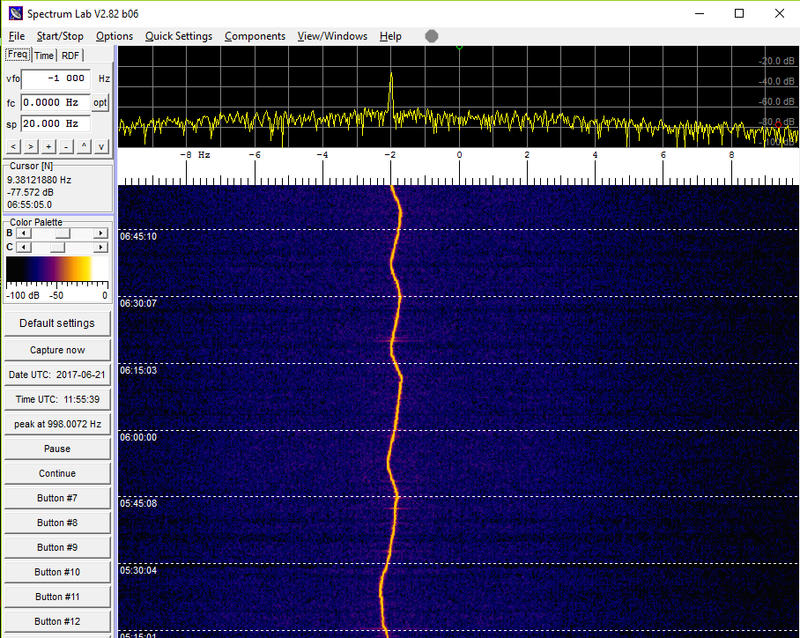 Set the radio to USB mode tune it 1 kHz below the signal to be measured. You will hear a roughly 1 kHz tone. The frequency will be affected by the ionosphere, the DDS error in the receiver, and sample rate error. Set the radio to AM mode and tune it to the frequency of the signal to be measured. Mix in a local oscillator set to 1 kHz below this frequency. This measured frequency in this method will be affected by the ionosphere, the sample rate error, but not the DDS error in the reciever. 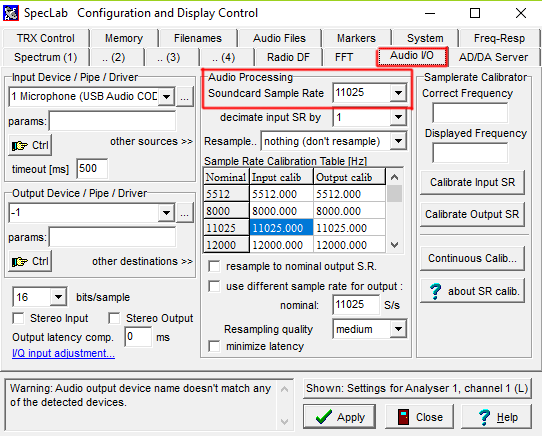 Configure Spectrum Lab to sample audio at 11025 Hz. Figure 2: Spectrum Lab Audio I/O settings. Configure Spectrum Lab to compute 512k-point FFTs. 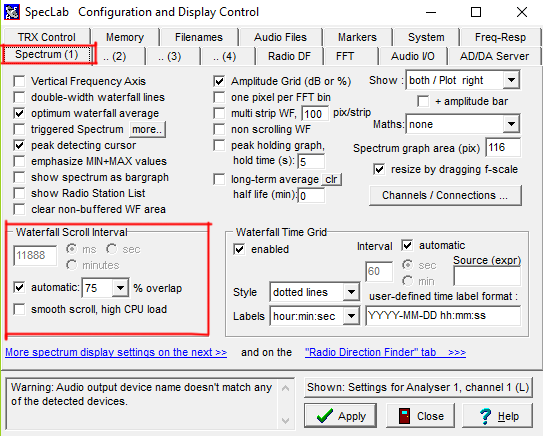 Figure 3: Spectrum Lab FFT settings. Configure Spectrum Lab to overlap FFTs in time, producing a new FFT every 12 seconds. Figure 4: Spectrum Lab spectrum settings. 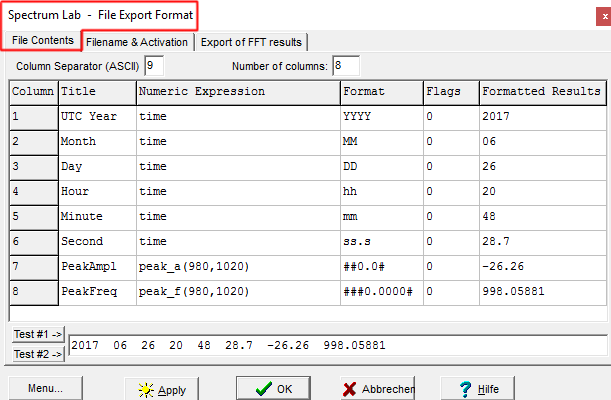 Configure the processed file output parameters of Spectrum. 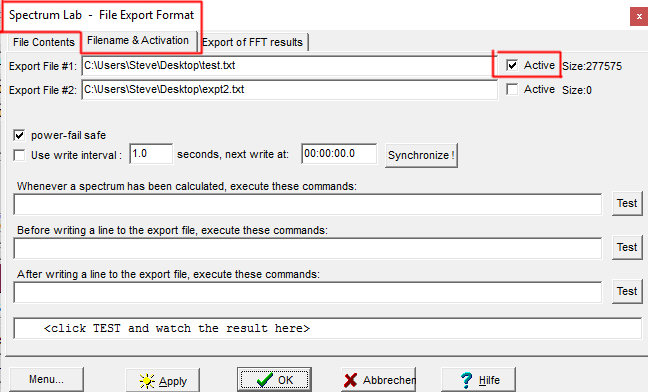 To do this, go to File --> Export FFT and make your settings match those in Figure 5. Figure 5: FFT file contents settings. Enable saving of the processed data file. Figure 6: FFT filename settings. Figure 7: Example FFT file. Figure 8: Enabling streaming/saving to a WAV file.